How could I ever let Christmas Eve pass without at least reading this iconic poem to myself, or sharing it here? The answer is that I simply can’t. This poem has become; over the more than 100 years since it was first published; a part of Christmas uniquely American, somewhat akin to the identification of Charles Dicken’s “A Christmas Carol”, as it defines the British Christmas experience of the 1800’s. This is one of those things that I will most likely post each year. Without grandkids closeby to share it with, I have to share it with somebody… Thanks for being here to enjoy it with me! Mr. Moore wrote the poem “Twas the Night before Christmas”, or, “A Visit from St. Nicholas" in 1822. He could hardly have envisioned the impact which his poem would have upon the world for years to come. 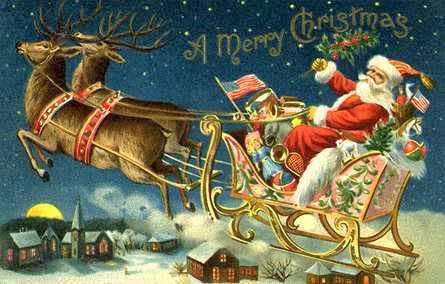 This year marks the 191st Christmas since the poem was first published anonymously in the New York Sentinel. It wasn’t until 1844 that Mr. Moore allowed his name to be associated with his creation. There is no doubt that he would be surprised that his poem has lasted this long. We’re not.